Google is further improving Maps on mobile and while the changes aren't major, they are definitely making users lives much easier. The latest Google Maps update brings a new feature for both Android and iOS users, which will allow them to find search for location reviews easier than ever. Whenever you're using Google Maps on your mobile phone, you will be able to search reviews for keywords or phrases. 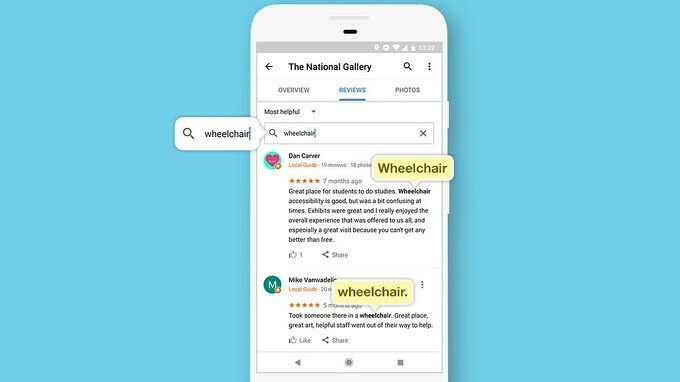 For example, if you want to know if a location is accessible to wheelchairs, you can now search for the “wheelchair” word through all the reviews posted by visitors. If anyone did mention the word, Google Maps will find it. In fact, the app will now pull up all the reviews that mention the “wheelchair” word or whatever word you're searching for, which will allow you to find even more details about the location. In order to use the new feature on an Android phone, simply open Google Maps, search for a place, tap the Reviews tab and type what you are looking for into the search bar. However, if you're using an iPhone, when you search for a place on Google Maps, you need to scroll down to the Reviews section and type the word that you're looking for into the search bar.